We are 3 optimistic people who believe in the power of making our dreams come true and inspiring others to do the same. We are following our passion of making the world a better place, of spreading a message of kindness, love & hope. We are living aloha. Caron and Rob have shared in plenty of experiences during their 34 year adventure together. Opportunities/challenges, joy/sadness, happiness/heartache, learning/growing, happiness/frustration, abundance/setbacks, things that most people can certainly relate to. Through everything, they choose to live a life of optimism, of wonder and of believing that goodness prevails. Their travels have taken them to the Hawaiian Islands several times and they were instantly captivated by not only the beauty but of the mana (energy) that exists. This mana, the kindness of the people and the breath-taking beauty of this magical place brought them back many times. 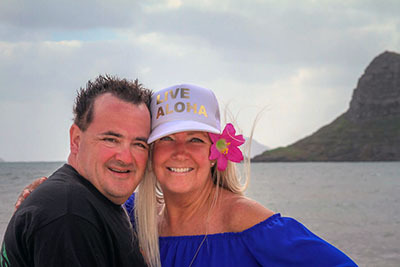 They had the privilege of living and working in Hawaii for a year and they made a commitment to submerge themselves into the culture to gain a deeper understanding of the people and history of Hawaii. It was then that they discovered the beauty of “living aloha”. They volunteered, they networked with the locals, Caron joined Halau Kiuwailehua, they supported local businesses, met the hardworking owners and learned of their stories, they went where the locals went, Caron joined Toastmasters, Rob learned about Hawaiian business, they gained knowledge, understanding and compassion of the Hawaiian history and way of life. 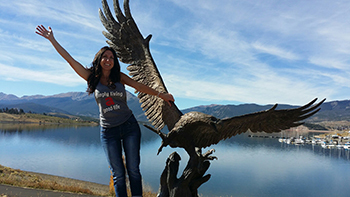 Lorie is an entrepreneur at heart who has impacted many with her grace and generosity. She honors her own stories, experiences and personal growth which have propelled her to new heights of learning. This new level of learning has excelled Lorie’s skills in business by promoting positive experience in business. Lorie shares in the passion of “living aloha” and spreading this message globally to create positive change in a world that needs it more than ever. Caron, Rob and Lorie each have unique talents and gifts, just as everyone on this planet does. Joining together to “be and do more” is exciting and believing that they can make a good difference in people’s lives is even more exciting. Together the three of them will spread the beautiful and powerful message of “Live Aloha” globally, through merchandise, stories, adventures and positive actions. Aloha is not only a word, it is a way of living, an attitude and expresses guidelines to help us in our lives – kindness, patience, compassion, respect, togetherness, affection, empathy, peace, & love. Aloha means we are able to recognize and appreciate the uniqueness and differences each of us bring into this world. Honor and respect your family, friends, and all the people who pass through your life. Aloha does not pass judgement on others for it always trusts, always hopes and always protects. It is that aloha, caring and spirituality that allows us to build on each others strengths and join together on this magnificent journey we call “Life”. There are plenty of reasons to be hopeful with the state of the world and life right now. There are many people focusing on what’s good, what will go right and living a love based life as a result of this. This mindset perpetuates all facets of people’s experiences and affects thoughts, words and actions. So the cycle continues. We are choosing to spread a movement and way of life to continue this for ourselves and others. 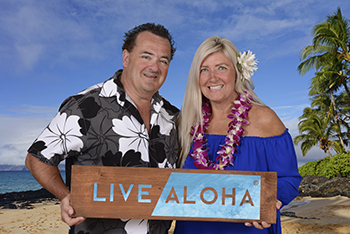 We are choosing to live aloha!